Lovely star-shaped petals of salmon pink neatly blend to lemon yellow next to apple green nectaries, and if you look closely, there are faint orange-red speckles along the raised papillae, giving a nice accent to go with the softly ruffled petals. 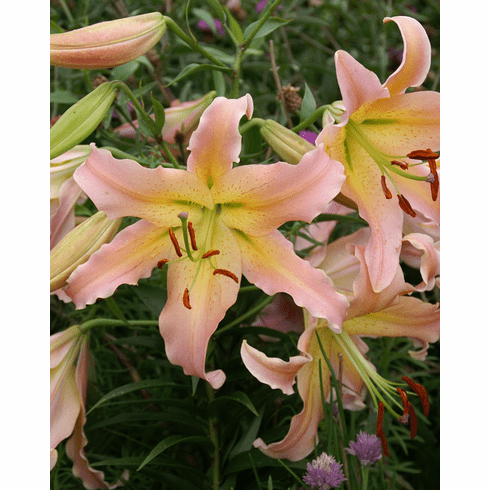 Nice planted nearby to 'Conca d' Or', 'Tollo' or 'Golden Splendor Strain' or the other peach lilies, for an overlap in flowering times. A uniquely colored lily, there is nothing else that comes close in its class. 3 to 4+ Feet. July/August Flowering. Fragrant. Bulb Size - Our standard for bulbs of this lily cultivar ranges from Premium-size (16/18cm) to Exhibition-size (over 20 cm).